It’s always been difficult for me to maintain a daily sketchbook for drawings. I am not exactly sure what the reason is, but I think part of it has to do with my psychological inability to be visually imaginative and create scenes in my head to transfer to paper. Usually, I am better at sketching things I am looking at in front of me that I can respond to in realtime, but I got tired of drawing people in public or coffee cups at cafes. It’s not easy for me to carry around an array of props and objects to make impromptu still lifes while on the go, and even if I did arrange props at a home studio, they would always end up feeling stale, so eventually I just gave up daily sketching altogether. As I’ve mentioned in a previous post, I have been finding VR an interesting in-between space where I feel safe to quickly create endless arrangements of objects. In my VR-studio, objects don’t feel stale, because they are lightweight and I can always easily change their scale, color, rotation and position, or instantly change the shape altogether. Additionally, since it is very easy to take in-VR screenshots, I not only create 3D “sketches” (as 3D models) but can also quickly make many 2D “sketches” (as screenshots) based on different angles of the VR scenes, similar to sketching an object from various angles in real life. With the addition of mobile-based AR that I’ve recently been using, I’ve been able to take these VR-studio objects (and other 3D scanned objects) out in public as well. When I’ve been inspired to sketch or create imagery, I’ve been able to quickly “materialize” the objects into AR and take screenshots as sketches on my smartphone. I put the AR objects on top of other random objects and surfaces around me, and I take endless screenshots as I find compositions that feel good to me. All of a sudden, I have found myself with more sketches than I know what to do with, and it feels refreshing to look back at all my screenshots periodically and take the time to absorb them and see a visual language start to develop. As a painter, I’ve always been inspired by the visual foundations established by post-war abstraction which have led to the more recent trend of collage in contemporary painting seen in artists like Bruce Wilhelm, Keltie Ferris, Lauren Luloff and Zak Prekop. These painters break the depth, texture and color of the canvas in ways that are surprising and jarring but are also somehow harmonious in their dissonance. With my new sketchbook full of VR/AR imagery, I finally have enough source material to make my own collages. I have been editing the images digitally to play with color shifts, and then either collaging them digitally or printing them on paper and tearing them up to make physical collages. 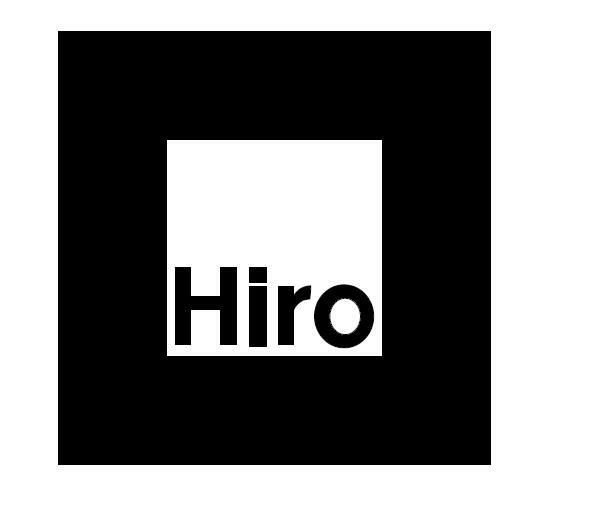 If you’d like to try your own AR smartphone-sketching, try visiting this page and using a HIRO marker to make a stack of red cake slices appear, or remix the page here to use your own 3D models! Since my new sketchbook has 3D models in addition to 2D images, I realized that I can use them to help me create physical sculptures and not just physical paintings. I recently discovered how to export the 3D .obj models from Anyland into the .fbx format that the Microsoft HoloLens supports, using a freely available app from Autodesk called FBX Converter. Once in the HoloLens, I can open my VR sculptural sketches in 3D Viewer Beta, which allows you to place, rotate and scale objects in a persistent AR scene. One of the first things I did was place my VR sketches in a corner of my new barn studio. I wanted to see how they felt outside of the virtual world and in a physical space, continuing the experiments I began back in January while at Banff. I was surprised at how easily I was able to make a physical sculpture using the AR model as a guide. I found that my previous experience in drawing by sight was easily translated to this process; it almost felt like drawing in three dimensions. The process reminded me of a class at the New York Studio School called Sculpture Marathon, which I have always been interested in taking . In this case, however, I skipped over sculpting from real life objects like fruit or props and jumped straight to sculpting from an augmented reality object. The process was so fast and automatic that I found myself intuitively repurposing scrap materials I had around the studio like sponges, foam, plaster and plastic. I tried filming via the HoloLens while I was working, but when reviewing the footage later on I found that I was working too fast to capture anything appropriately. In addition to copying the AR model in physical materials, I also found myself trying to take pictures of the surprising moments that are usually lost to the fast artistic process. At one point, I tried to cut a bar of soap in half and discovered that soap doesn’t cut cleanly but instead splinters into beautiful shards. This is usually the kind of moment that I try to remember later on as a potentially useful technique for a future artwork, but which can sometimes get lost in the mess of a studio practice. With AR headsets, it seems like there is a possibility to capture those moments in the moment, and then immediately continue working without having to disrupt the creative flow. Now that I have adopted sketching in Anyland as part of my studio practice, I am excited to bring those sketches to life by using them as AR models to sculpt from in my physical art studio. Even though these first few studies are small in scale, they give me ideas for what materials may work at a larger scale. Next, I would like to buy much larger blocks of foam so that I can try making larger sculptures, mimicking the life-size scales that I’ve been experimenting with in VR. It feels amazing, and almost like a “physical” privilege, to be able to easily move these objects around as I find what feels good. Without having to worry about the technical details of how the objects will stick together or stand up without falling over, I am able to just move, rotate and scale them on a whim. This quick way of working lets me quickly come up with arrangements that feel fresh to me. They feel very similar to the experimental still lifes that I have blogged about before, except this time it is at a much larger scale. Since I am not limited by using a smartphone as the viewing window, I can freely walk around the sculpture and work more directly with the objects. Eventually replace the AR objects with the foam ones? I’d love to materialize some of these sculptures completely in physical materials so that I can coat them in paper mache or plaster, and then paint freely on them with spray or acrylic paint. I should have been able to make these kinds of sculptures before, but I had never been able to make arrangements that felt right to me; it was either taking too long, or I felt too precious about the materials and objects. With AR, I am finding the arrangements quickly, not having to be precious about materials, and it feels like I’ve finally overcome the obstacle to making the sculptures I’d like. I am really looking forward to making more of these soon, and hopefully at this large scale! I look forward to seeing how our art practices continue to evolve!